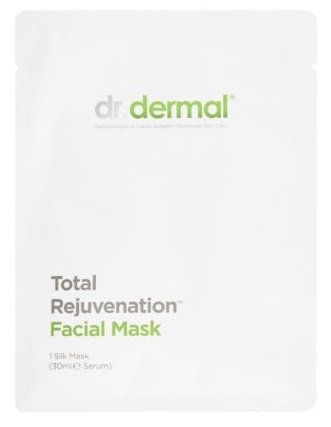 dr.dermal’s Total Rejuvenation Mask is a luxurious, organic, anti aging sheet mask made of organic silk. It is packed with an ultra-hydrating nourishing serum formulated to plump up, soothe and invigorate your skin. The Total Rejuvenation Mask is, ideally, used as a weekly treatment booster, or it can be used after skin treatments such as collagen induction therapy (microneedling) or chemical peels. This cooling and calming serum is perfect for all skin types, even those that are sensitive. The serum contains two highly active peptides that stimulate DNA repair and skin renewal. The Hyaluronic acid moisturises and plumps up the skin which reduces the appearance of fine lines & wrinkles. It’s the perfect weekly booster for dehydrated skin! The convenient pouch also allows it to be easily packed for travel. The Total Rejuvenation Mask can be used weekly as a hydrating treatment; post microneedling or chemical peel; after air travel; or exposure to dry climate (mountains, desert etc). Check out this independent review on dr.dermal here! Get a voucher for a friend or family member - they will be in for a wonderful treat!